Tapas (Spanish pronunciation: [ˈtapas]) are a wide variety of appetizers, or snacks, in Spanish cuisine. 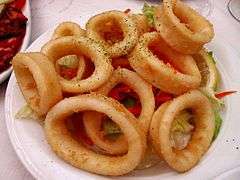 They may be cold (such as mixed olives and cheese) or hot (such as chopitos, which are battered, fried baby squid). In select bars in Spain, tapas have evolved into an entire, sophisticated cuisine. In Spain, patrons of tapas can order many different tapas and combine them to make a full meal. In some Central American countries, such snacks are known as bocas. In Mexico, similar dishes are called botanas. 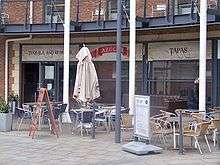 The word "tapas" is derived from the Spanish verb tapar, "to cover", a cognate of the English top. Before the 19th century, European roads were in bad condition. Some were originally old Roman roads (viae romanae); some were trails dating from the Middle Ages. Travelling was slow and exhausting. Most people could not read or write, and Spain was no exception. Inns, called posadas, albergues, or bodegas, grew up along the roads, offering meals and rooms, plus fresh horses for travellers. Since few innkeepers could write and few travellers read, inns offered their guests a sample of the dishes available, on a "tapa" (the word for pot cover in Spanish). In fact, a "tapa" was (and still is) a small portion of any kind of Spanish cuisine. According to The Joy of Cooking, the original tapas were the slices of bread or meat which sherry drinkers in Andalusian taverns used to cover their glasses between sips. This was a practical measure meant to prevent fruit flies from hovering over the sweet sherry (see below for more explanations). The meat used to cover the sherry was normally ham or chorizo, which are both very salty and activate thirst. Because of this, bartenders and restaurant owners created a variety of snacks to serve with sherry, thus increasing their alcohol sales. The tapas eventually became as important as the sherry. Tapas have evolved through Spanish history by incorporating new ingredients and influences. Most of the Iberian Peninsula was invaded by the Romans, who introduced the olive and irrigation methods. The discovery of the New World brought the introduction of tomatoes, sweet and chili peppers, maize (corn), and potatoes, which were readily accepted and easily grown in Spain's microclimates. In Mexico, there are not many tapas bars. However, the "cantinas botaneras" come close to the Mexican version of a tapas bar, but they operate on a very different business model. The appetizers (botanas) keep coming as long as the patron keeps ordering beer, liquor or mixed drinks. The more the patron drinks, the more he or she eats. These establishments, some over a hundred years old, such as La Opera, are particularly popular around the Centro Historico in Mexico City, but there are similar cantinas farther out in Coyocan or even in somewhat nearby cities like Xalapa, Veracruz.